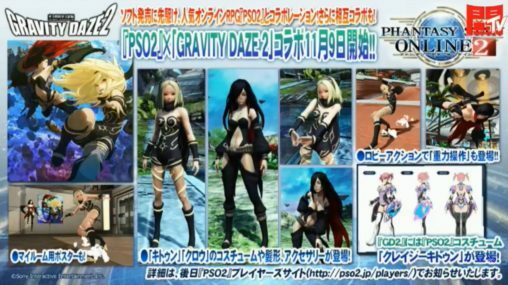 Gravity Daze 2 will be collaborating with PSO2 to bring you costumes, hairstyles, and accessories from Kat and Raven. The collaboration also includes the signature [gravity manipulation] concept as a Lobby Action. Kat demonstrated this by gracefully sliding across the main lobby until she came to a complete stop with a backflip. Expect to see these items become available in the upcoming November 9th update. thats a joke right? like sarcasm? thats a joke right? like sarcasm? just wondering because this is the most boring thing ever. That Gravity Slide LA though holy crap I neeeed it. Guess what? that ll be our new 30m hairstyle and lobby action. 30 mil? I think the first LA will be quite a bit more than that. Yeah on ship2 there are many crazy bunch seller who sell overprice stuff even when the scratch still on (idk in other ship if like this too). But once again i think the craziest are the people who buy that. Cuz people buy that it make the prize will stable in op. And if no demand ofc the price ll drop. Or maybe it cuz the inflation is already beyond our imagination? I rather suspect they’re just more interested in making a bigger profit down the road once the supply has dried up than quick cash while the scratch is still up, and freeing up storage space while they’re at it. 30m for that lobby action? That’s generous. All the “animers” are sure to be saving up their TACO money they should be spending on gear to instead make their awful cosplay go sliding around. Which means they’ll start buying right away and jack the price up insanely high. Really annoys all the fashionistas who, while they wouldn’t spend their money on gear either, at least didn’t buy everything asap for ridic prices. Why do you assume people don’t have good gear *and* OP lobby actions? I for one have good gear and am also saving up the millions needed to get that new LA asap. 90% of the game is fashion and lobby actions for me, but I do top damage and certainly don’t neglect my gear. Besides the fact that, really, if someone enjoys a lobby action more than +150 on everything, more power to them in my book. We all play for different reasons. Saying they should spend all their money on gear and woe to them if they dare buy an expensive cosmetic item really irks me. Also yeah, 30m definitely an underestimate – it’s gonna cost way more. inb4 its a bonus scratch item only (very likely). Is there no new live broadcasts? i’m so used to having an idea of new content for the next month but as far as i know nothing has been shown for November updates. early november was shown as another psu collab. This proves once again that cel shading is cancer, and should be removed from existence. I like cel-shading, and would rather remove every 3D models and replaced them with cel-shaded ones. 30m seems a tad too expensive for an incentive to show off to your friends. Fashions I can tolerate, but with all the Gix weapons floating around I am more inclined to save my money for grinding them. For the price of grinding up a single Austere, I can grind up a rainbow set of Gix Weapons.